Having challenged myself in 2015 to reduce my collection by 365 games, which was about a third of my total collection and succeeded in selling over 400, this year I’m going to see if I can get my collection down to below 400 games, which means again selling about a third of the games I own. I arrived home tonight to find a delivery from Philibert had arrived. The overly large box contained two small card games that I’ve been itching to get hold of. Arboretum is a clever puzzle-like card game, the English Z-Man version of which has been sold out over here for ages, so I decided to grab the French Filosofia edition. 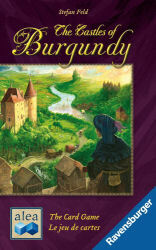 And The Castles of Burgundy: The Card Game is an English / French edition that hasn’t appeared on general UK release yet but looks an interesting card-only version of the board game and has solo rules for playing against Aaron (An Almost Real OppoNent). Looking forward to playing both. TIME Stories: A Prophecy of Dragons – The third scenario was better than the second and adds a second level to the exploration. Pretty good but not sure if there’s enough different going on to keep me wanting to try more. 3 sind eine zu viel – Another 6 Nimmt type of game that worked very well, although I got absolutely thrashed by Jan in our first two-player outing. Bomb Squad Academy – This is a pleasant enough push your luck / second-guessing game of trying to defuse a bomb without setting it off. Bottom of the 9th – Only tried this solo and I’m not sure if it quite works. It’s not going to displace Harry’s Grand Slam Baseball as my go-to baseball game. Karuba – Create paths in the jungle to lead to the different treasures before your opponents do. Excellent puzzle in the Take it Easy style, plays quickly and one I see me playing both with the game club and family. Machi Koro: Millionaire’s Row – Second expansion works very well with the base game, although I wouldn’t want to combine both expansions as it would probably outstay its welcome. Still think Machi Koro is an excellent design. Quadropolis – New Days of Wonder game that works really well. It is quite a thinky game and it gets more so from round to round but it is fun to try and optimise your layout, although I found it very easy to mess up with the early placements. Smash Up: Pretty Pretty Smash Up – Smash Up is ok in small doses but I didn’t really enjoy these new cards. Jan found the cats really odd and confusing. I sold 24 games and added 5 new games to the collection: Bottom of the 9th, Karuba, Quadropolis, Sapiens and Tokaido Deluxe Edition. My total collection stands at 601. My unplayed list is down from 15 to 7, and my Game of the Month was Karuba, a nice treasure hunting puzzle game.